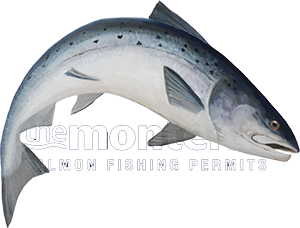 The entire salmon fishing experience for all fishing guests is the name of the game from a professional ghillie's stand point if returning fishing guests are what they're trying to achieve. In the old pre-internet & social media era when my work started on the Tay if you weren't getting quality salmon fishing referrals from existing fishing guests & be-back business you'd have a quiet salmon beat. To achieve these things you had to be running higher overall service levels than your competitor beats and that worked a treat and I doubled my beat's turnover each year for the first 3 years with that winning formula approach. From a salmon fishing guest's point of view it was the 'attention to detail' and preparedness of the salmon fishing hut that got their attention long before you took them around the beat and astutely pointed out exactly where their best daily chances of hooking a salmon were to be found. Personally my kettle was quietly whistling away before the first guest's car ever drove in at the back of 8am and the entire fishing hut and surrounding area would be immaculate and fully ready for all of the guests. There's big satisfaction for all professional ghillies too when their beat & hut is looking at its best and ready for the fishing day. They say first impressions go a long way to sizing up compatibility and the potential of a relationship so aside from the instant hospitality all fishing guests would receive it was always important to my mind that the salmon fishing guests knew without a shadow of a doubt that I was taking their salmon fishing day very seriously. As a professional ghillie it's easy to take the sheer magic of the river for granted but placing yourself into another man's boots who's fighting in the concrete jungle for a living is a good & 'grounding' thought to consider. A big part of the magic of our pursuit is the brilliant 'escapism' back to mother nature and the basic 'hunter gatherer' distant memory recall. To pursue an often unseen amazing creature like a wild Atlantic salmon in such beautiful surroundings in itself is a huge part of the enjoyment of this pursuit. The flow & swirls of the river the cry of the osprey and just breathing in the natural greenery away from the electronic controlled zones of modern day society are just as potent for many anglers whether that initial tug on the fly reel commences or not. The riverside banter of a party of salmon fishers in amongst a ghillie who's got a bit of social & professional spark about him can also lead to amazing sit downs after the fishing day is over. I can recall with clarity special moments in salmon fishing huts that go right back to the early 70's as if they were branded into my memory banks for life which they have been. The interaction of kindred spirits over a quality dram reflecting on the brilliance of the salmon river whether a fish was caught that particular day or not is and always has been another major part of the attraction of this amazing sport. If a professional ghillie is focussed too much on personal catches then other areas of their business operation will be suffering. The secret of running a successfully run salmon beat and maintaining consistent catches is 'talent spotting' at guest arrival time first in the morning. Playing all the fishing guests to their strengths in the most appropriate salmon pool areas dictated by the daily water conditions is the key for making sure salmon are caught. Managing a busy salmon beat of 6 to 8 rods and keeping all guests happy with their day on the river is indeed also a skill in itself. As a professional ghillie there's repeat booking value in monitoring and knowing all guests are fishing contently through every hour of their fishing day.